Catastrophic drought is on the near-term horizon for the capital city of Bolivia, according to new research into the historical ecology of the Andes. If temperatures rise more than 1.5 to 2 degrees Celsius (3 to 5 degrees Fahrenheit) above those of modern times, parts of Peru and Bolivia will become a desert-like setting. The change would be disastrous for the water supply and agricultural capacity of the two million inhabitants of La Paz, Bolivia's capital city, scientists say. The results, derived from research funded by the National Science Foundation (NSF) and conducted by scientists affiliated with the Florida Institute of Technology (FIT), appear in the November issue of the journal Global Change Biology. 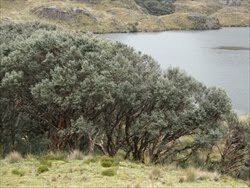 Climatologist Mark Bush of FIT led a research team investigating a 370,000-year record of climate and vegetation change in Andean ecosystems. The scientists used fossilized pollen trapped in the sediments of Lake Titicaca, which sits on the border of Peru and Bolivia. They found that during two of the last three interglacial periods, which occurred between 130,000-115,0000 years ago and 330,000-320,000 years ago, Lake Titicaca shrank by as much as 85 percent. Adjacent shrubby grasslands were replaced by desert. In each case, a steady warming occurred that caused trees to migrate upslope, just as they are doing today. However, as the climate kept warming, the system suddenly flipped from woodland to desert. "The evidence is clear that there was a sudden change to a much drier state," said Bush. Scientist Sherilyn Fritz at the University of Nebraska-Lincoln showed that during these warm episodes the algae living in Lake Titicaca shifted from freshwater species to ones tolerant of salty water. Paul Baker of Duke University identified peaks of carbonate deposition. Both point to a sudden shallowing of the lake due to evaporative loss. An environmental reconstruction demonstrates that with moderate warming, forests moved upslope. But as that warming continued, a climate tipping point was reached. The system was thrown into a new, drier state that halted forest expansion. The tipping point is caused by increased evaporative loss from Lake Titicaca. As the lake contracts, the local climate effects attributable to a large lake--doubling of rainfall, among the most important--would be lost, says Bush. Such tipping points have been postulated by other studies, but this work allowed the researchers to state when the system will change. Based on the growth limits of Andean forests, they defined a tipping point that was exceeded within a 1.5 to 2 degrees Celsius warming above modern conditions. Given a rate of warming in the Peruvian Andes of about 0.3-0.5 degrees Celsius per decade, the tipping point ahead would be reached between 2040 and 2050. "The implications would be profound for some two million people," says Paul Filmer, program director in NSF's Division of Earth Sciences. Severe drought, and a loss of stored water in lakes in the region, would reduce yields from important agricultural regions and threaten drinking water supplies. The research suggests that limiting wildfires would help delay the worst effects of the drought.